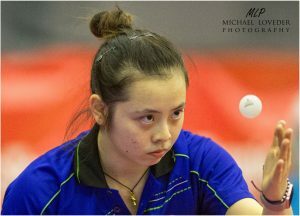 Success against the host nation’s Gaja Mavri and Hong Kong’s Liu Qi in the qualification stage of the Under 21 Women’s Singles event at the 2017 Slovenia Open in Otocec, Belgium’s Nathalie Marchetti continued her outstanding form on the morning of Friday 28th April. She caused a major upset in the opening round of the event by beating Germany’s Nina Mittelham, the no.3 seed (11-6, 11-8, 7-11, 5-11, 11-7). Defeat for Nina Mittelham but she was not the only notable name to experience defeat at the first hurdle of the Under 21 Women’s Singles competition. Furthermore, there was more success against the odds for Belgium and more disappointment for Germany; for the former Lisa Lung excelled, for the latter Wan Yuan suffered. Lisa Lung accounted for Hungary’s Bernadett Balint, the no.9 seed; she emerged successful in a full distance five games encounter determined by the minimal two point margin (5-11, 12-10, 9-11, 11-8, 11-9). Meanwhile, Wan Yuan experienced defeat in three straight games when facing Croatia’s Andrea Pavlovic (11-4, 13-11, 11-7). Impressive victory margins but life had been more exacting the previous evening; against Belgium’s Lisa Lung; bronze medallist earlier this year in Sochi at the European Under 21 Championships, it had been a much different story. 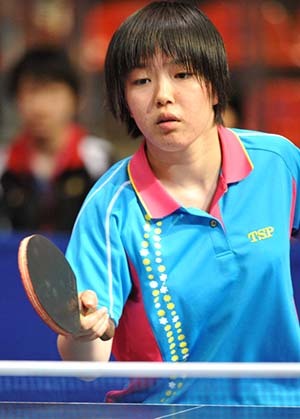 Saki Shibata had been required to recover from a two games to one deficit to secure success (5-11, 11-9, 6-11, 11-9, 11-3). Voor Lisa was het trouwens de eerste keer dat ze met de nieuwe ballen DHS D40+ speelde, wat toch een hele aanpassing vergde.